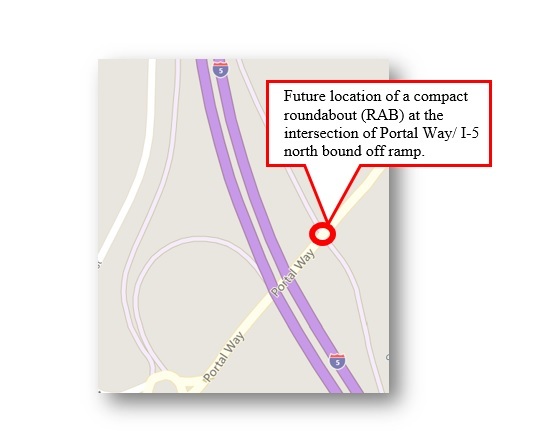 Preliminary compact roundabout design provided by Reichhardt & Ebe Engineering, Inc. Click to enlarge. Use of the Portal Way/ I-5 interchange has increased following the improvements to Second Avenue and installation of the single lane roundabout at the southbound interchange. This has caused the northbound ramps at the Portal Way interchange (Exit 263) to reach capacity and back up into the mainline of I-5. The backups restrict left-hand turning movements from the ramp to Portal Way, leading to increased congestion during peak traffic hours. This project will increase capacity, improve safety and provide an increased level of service at this intersection. 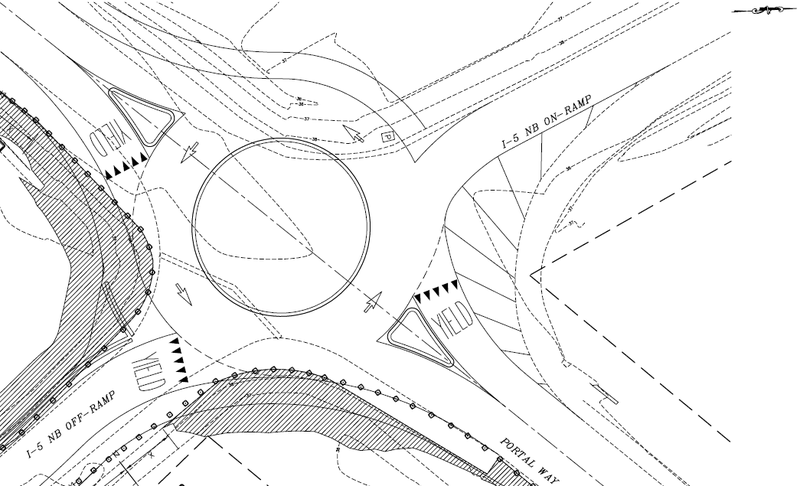 By constructing a compact roundabout, the City can provide a safe and cost-effective solution in a relatively short amount of time. Construction is scheduled to begin July 30th, 2018. Work will include removal of structures and obstructions; trench excavation; storm sewer pipe installation; pre-cast curb installation; modifications to existing illumination and intelligent traffic systems (ITS) and other work. 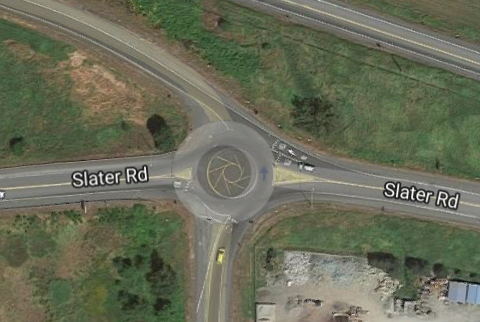 Once complete the roundabout will look similar (in size & design) to the recently constructed improvements at Slater Road. Note to bidders: Bids will only be accepted from Bidders who are listed on the planholders’ list. If you download plans and specifications from this website, please email Public-Works@cityofferndale.org to be added to the planholders’ list. Plans and specifications are also available for purchase ($50 per set, non-refundable). Record of Bid Opening – These are bid results only, and the bid tabulation will be posted separately once available.